Fun at the Red Bee! 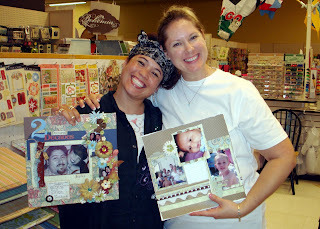 Nan and I Zuttered at a 24-hour crop at The Red Bee in Tustin, showing the croppers and walk-in shoppers how to make a 3x4-inch mini book with the Bind-it-All. The rest of the time we cropped our kids' pages, met some lovely ladies and participated in the contests. 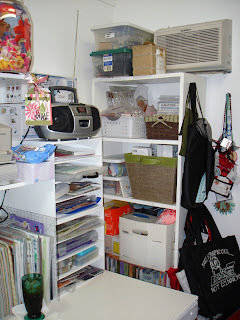 There was also a very cool contest - a page swap where you gather up the items and photos you are using for a layout and then it is given to someone else. They create your page with your stuff and anything they want to add. I was so excited when I won! 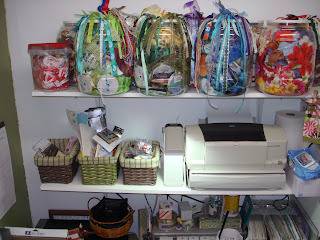 I had scrap celebrity Donna Salazar's stuff, so the pressure was on! But she made it easy by giving me some great stuff to work with. The picture above shows Donna holding the page I made for her, and me holding the page she made for me! 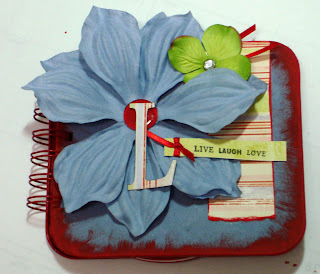 Check her out at her blog, A Painterlady's View: www.donnasalazar.typepad.com! I've also added to the list of my favorite sites! Nan's birthday was the Thursday before (she is 29, again) so I brought cupcakes and everyone sang happy birthday to her. 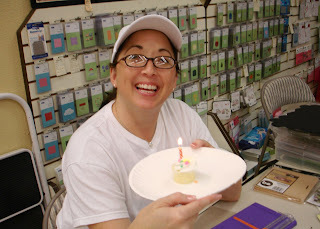 Nan took top honors in a page contest using paint ... check out her blog, too! 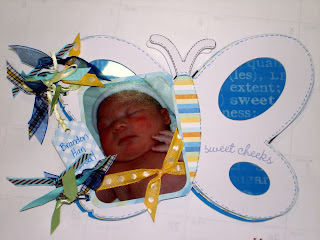 My two favorite projects I have recently created are a CD mini album that I made from a metal AOL CD holder and CDs that I painted with red cryclic paint and a butterfly minibook featuring my new nephew, Brandon. 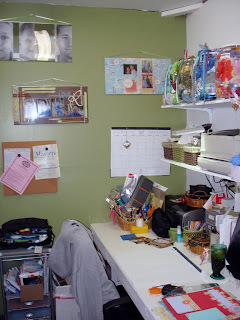 The covers are picture above, but to see more of each project, visit the Zutter Zisters site and click on the Inspiration Station page! Jeez ... Has it really been a whole month since I blogged here?! Wow! 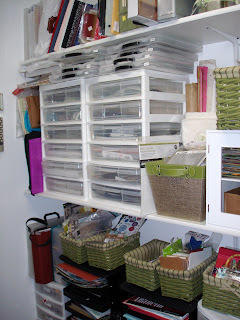 Well, here is one of the things I have been busy with - my scrap room! 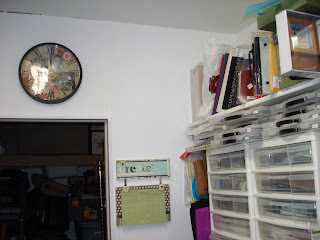 My hubby and Nan's hubby built me a scrap room in my garage in January and I have finally "made it my own"! It's 8 x 8 x 8 feet, roughly, and FULL of scrap stuff. 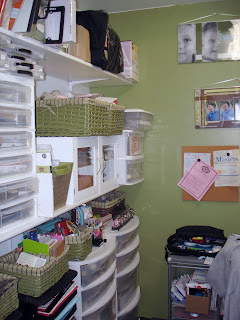 I managed to neaten it up for these pictures, but it is already a mess again! It's starting to feel like home now!